Fiction – hardcover; Harper Collins; 321 pages; 2014. I read it back-to-back with William Trevor’s Love and Summer, and couldn’t help but see the similarities between them. Both are gentle, comforting, slow-paced reads, about people quietly getting on with their lives in a small, close-knit community. Indeed, in KevinfromCanada’s review of Tell, he suggests the book is a Canadian version of the Irish village novel in which “a collection of ordinary people try to deal with life, even if they have been touched by extraordinary events like war”. While these two storylines are distinct, they are not separate. Itani fleshes out the relationships and links between the two couples to create a sense of family and shared history, almost as if they represent a microcosm of the village itself. Not much happens plot wise except to move towards the choir’s annual New Year’s Eve concert, although even that is not the real climax of the novel, which ends with a revelation about a secret long-held by Am and Maggie. But the novel works in terms of the well-drawn characters, for it is their quiet conversations, their actions, the roles they play in village life and their interactions with each other that gives the reader a reason to keep turning the pages. Sometimes, however, I felt the music element of the novel — the choir’s rehearsals and the performance itself — were slightly overworked, although I did enjoy the way in which Maggie’s rediscovery of her love for music helped her reconnect with emotions she had buried long ago. Her chance encounter with opera singer Dame Nellie Melba in Toronto before the war is beautifully drawn, if not quite believable. I also struggled with the revelations at the end. While heartbreaking, they bordered on a sentimentality that seemed at odds with the rest of the novel. But these are minor quibbles. 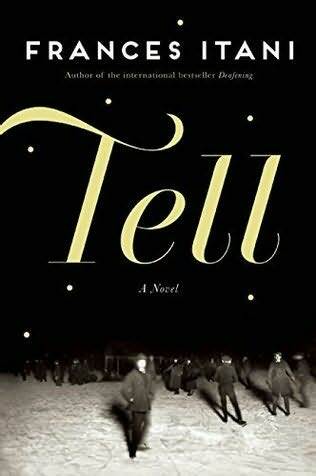 Tell is a lovely, quietly devastating book that focuses on small moments but never loses sight of the bigger picture: that we must all take responsibility for our actions; that life, despite its many challenges, heartaches and sorrows, is what we make of it; and that failing to deal with the past can sometimes come back to haunt us in unforeseen and tragic ways. I read this book as part of the Shadow Giller Prize. It is currently only available in Canada but will be published in the UK on 6 January, 2015. I think Tell is supposed to be a loose “sequel” to Deafening. I believe a couple Tress and her deaf sister feature in the earlier novel. Ah, that makes sense. I wondered if it was a pre-occupation for her. Thanks, Kim. I read Deafening when it was shortlisted for the Commonwealth Writers Prize and the ceremony was held here in Melbourne. I’d use the same description ‘quietly devastating’ It’s over ten years since I read it but I still remember the impact. I’ll be buying this one if it turns up in Melbourne bookshops. Did you review it, Lisa? No, alas, way too long ago.